The problem has been the ability to shoot in bright daylight / sunlight when the background or ambient exposure is (for example) 1/4000th sec at ƒ/2.8 and the subject or foreground is just 1/60th at ƒ/2.8. This means having to use fill flash to balance out the ambient and subject exposure while keeping the parameters of the ambient. If you did not have the ability to sync higher than 1/250th, you would need a wide variety of ND filters and for the good ones that can get expensive. 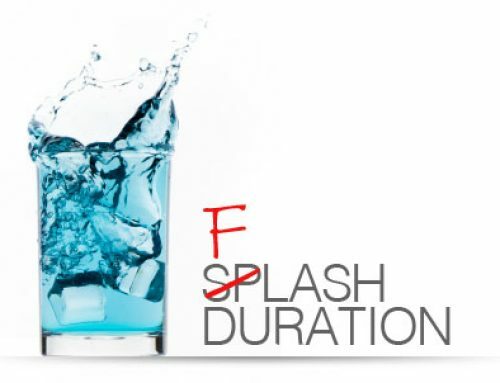 I think Canon has dibbs on the term HSS (High-Speed Sync) and Nikon has the same technology but different nomenclature termed Auto FP and both systems use their native flash systems to incorporate fast sync speeds. A typical sync speed without HSS or Auto FP was somewhere around 1/125th – 1/250th of a second or for more accurate syncing using the cameras X-sync function. Pocket Wiward has their MiniTT1 of FlexTT5 (for Canon or Nikon) to incorporate HyperSync which enables communication to the camera to trigger the flash just before the first curtain opens. Because of the complexity of timing (milliseconds) on different power sources, timing can be user adjusted for some strobes. Up until now there have been a couple of solutions that have been either consistent but lacking in speed and power, or fast and powerful but inconsistent. Profoto’s new solution for the B1 Off-Camera Flash has all of the benefits and none of the limitations. The B1 itself is about ten times as powerful as the average speedlight and fast enough to keep up with your camera. 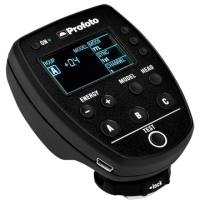 With the new Profoto HSS upgrade installed, you switch to HSS Mode with a simple button-press. 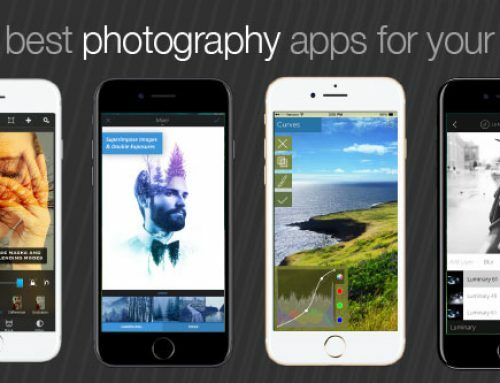 You will then be able to shoot at shutter as fast as 1/8000 of a second. It should be somewhat obvious that the Profoto B1 Off-Camera Flash is the main component. It’s a 500Ws that uses all of the Profoto light modifiers including a couple made specifically for the B1 head. 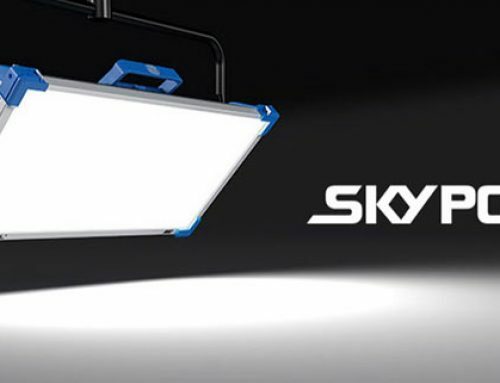 The impressive part is the 9-ƒ-stop range and can drop to 1/19,000th flash duration in the Freeze Mode and has an estimated 200+ full power flashes on a fully charged Li-Ion battery. The unit, including battery is just 6.6 lbs. (3kg for our northern or European neighbors). As the name dictates, the Air TTL-C is for Canon users and the Air TTL-N for Nikon users. In addition, this can also be used for syncing and manually controlling any Profoto unit that is compatible with Air (8a, D4, etc). 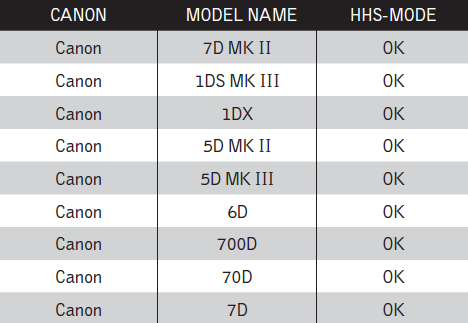 Profoto’s HSS works for both Canon and Nikon and has been tested for all common camera models listed below. 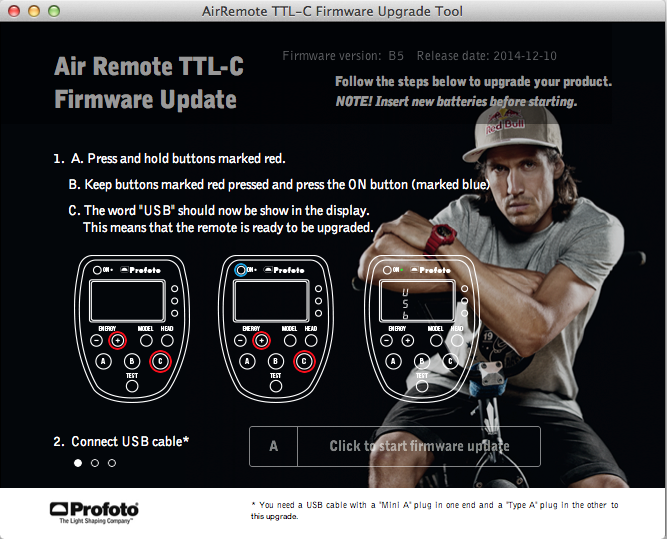 The screen-grab below shows the simple plug-and-play interface for upgrading, separate downloads are needed for the Air TTL and B1. After the upgrade to the B1 and Air TTL, you will have established communication for High-Speed Sync as indicated by the red outline below. 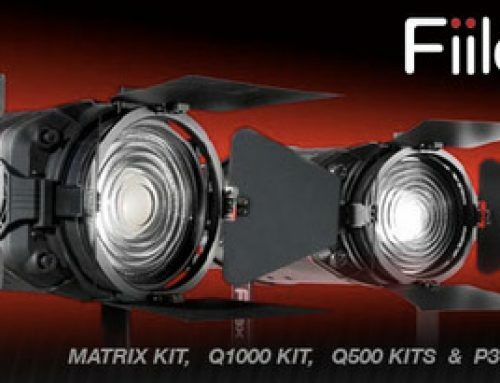 PLEASE NOTE: All of ProGear’s TTL-C / TTL-N as well as B1 heads have the firmware upgrades installed and are ready to use. Do not attempt to overwrite existing firmware. 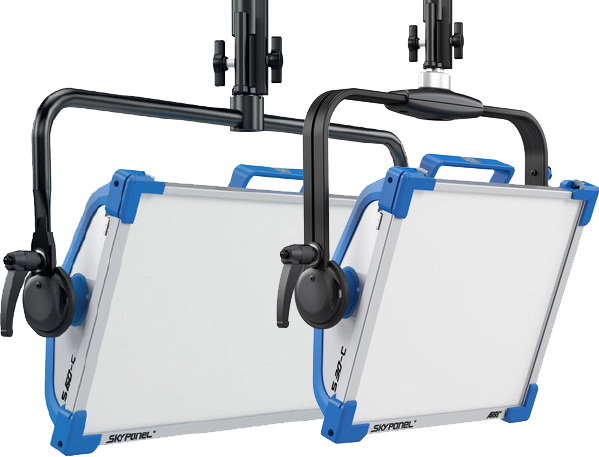 There are three lighting scenarios for the test using both TTL as well as manual settings. The images below were captured with a Canon 5D M2, Profoto B1 Off-Camera Flash, Air TTL-C, and Profoto Beauty Dish light modifier without diffusion and processed using Capture One v8. 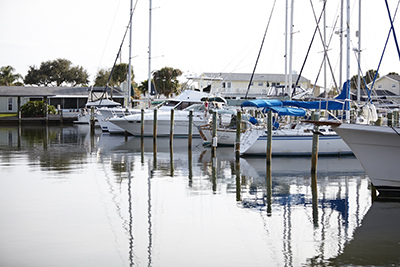 These are from the camera, no manipulation in the sofware except for a gray balance using an X-Rite Passport. In all scenarios, there was extremely harsh sun between 2:00 and 3:00pm. 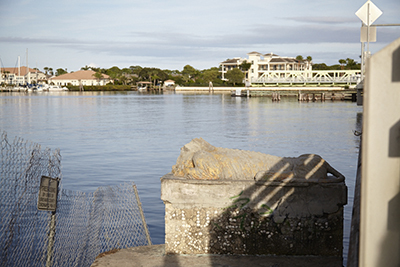 Upon initial set-up using the TTL took a bit of getting used to as with any piece of equipment. Although much of the process is indeed automated, you HAVE to be familiar with your camera, settings, eccentricities and how the TTL in the camera works with metering and auto focus. 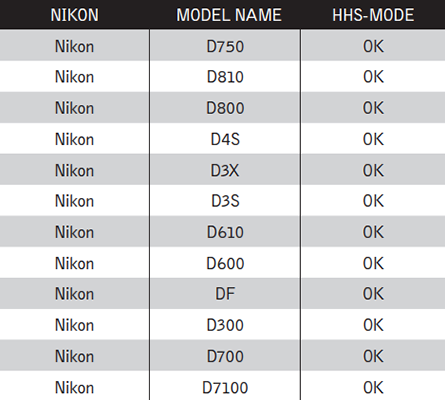 There are a couple of other pieces to be aware such as when going in HiSync, using the compatible Canon cameras the power setting will be set to 7.0 as opposed to the 8.0 setting in Nikon. The communication between the bodies and Air TTL is correct. When using TTL (non HSS) the camera will only go to 1/250th (or whatever is appropriate for your DSLR) and when set on HSS, the camera is released to go to 1/8000th. Some, repeat some, frustration was involved until some experimentation was done using TTL vs. Manual, HSS vs. 1st curtain sync. There is not a ton of documentation on the Air TTL but all of the profoto manuals can be viewed and downloaded from ProGear’s Support Page. The small amount of frustration just goes to show that you have to be a professional and know your gear. 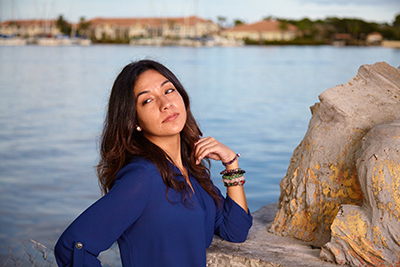 Overall, I was really impressed by the control and not needing to use ND filters to knock down the background and how well the B1 with the beauty dish was able to blend with the model and background. 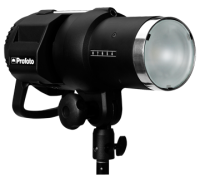 Keep in mind that ProGear is a Profoto dealer as well as rents the B1 units as well as the Air TTL-C and Air TTL-N. Call today for a demo 312-376-3770. 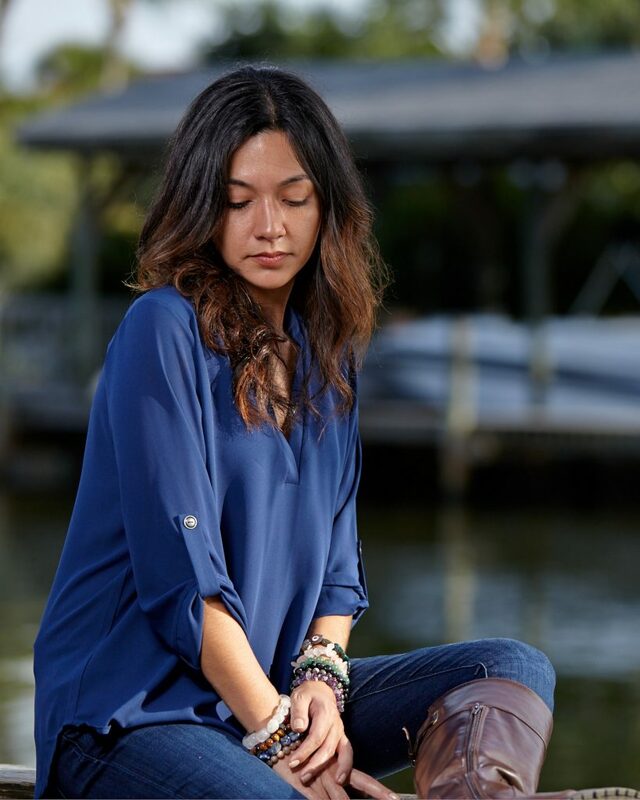 **Special thanks go to Stephanie Michele for being the model subject and to Marilyn Cook for all of the coordination and assisting.